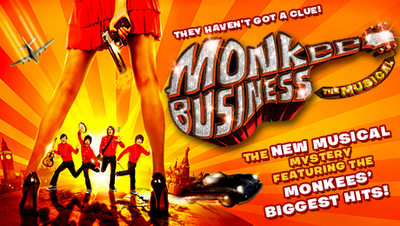 The idea for Monkee Business – The Musical came to writer Peter Benedict, he claims, when, in order to liven up a lengthy car journey with a bunch of theatricals, he randomly purchased a Monkees compilation CD and was surprised to find that “everyone, young and old, knew those songs”. 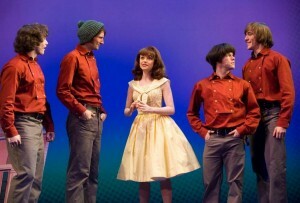 So a show built around some of the biggest selling songs of the sixties should be a hit – right? Weeeellllll…Jukebox musicals are problematic at the best of times, trying as they do to distance themselves from being nothing more than a tribute act, and few thrive or survive; only Buddy and The Jersey Boys have had the box office going ker-ching. Now when it comes to The Monkees, the problem stems from the fact that most people might know some of the songs, but much of the rest of their material isn’t necessarily that familiar and those songs have been included here. The fact these songs are shoehorned into a plot that treads a fine line between unintelligible and completely non-existent doesn’t help either. Is it a panto? 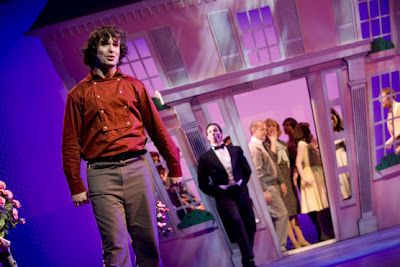 Is it a musical or is it a bad farce? 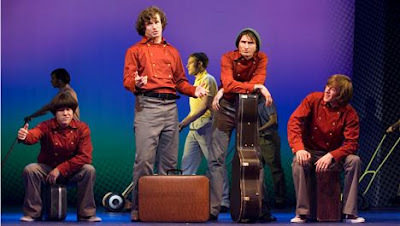 The story, such as it is – features four young lads who are conned by a producer into standing in for the real Monkees and going on a whistle-stop European tour in 1968. 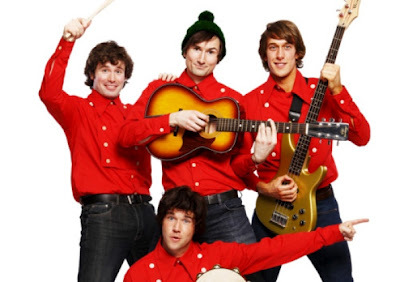 There’s Chuck standing in for Davy (played by Ben Evans), William for Peter Tork (Oliver Savile), Andy for Micky Dolenz (Stephen Kirwan) and Mark for Mike Nesmith (Tom Parsons). So our good-hearted but apparently dim-witted heroes set off on a train from Clarksville, arriving at Pleasant Valley on a Sunday and go on tour via plane, Orient Express and ferry. They play gigs, find romance and meet a motley crew of characters including Russian spies, singing nuns, a Beefeater, Pearly King and saucy traffic warden – you get the idea!!! Now there’s nothing necessarily wrong with a musical’s plotline being this ridiculous, but Benedict’s script over-uses a lot of chronic old jokes in an effort to raise laughs which often fall flat. Staging and sets are minimal, capital cities being depicted with dancers in national costume and for the band’s gigs there’s a small on-stage stage. Here at The King’s there’s a huge auditorium but it isn’t the biggest stage and even here the sets look bare and forlorn. 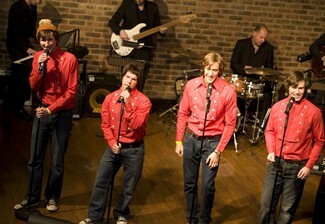 Now we have to get to the one success of this piece – the actors playing The Monkees – Stephen Kirwan, Ben Evans, Tom Parsons and Oliver Savile – are obviously massively talented and have certainly built up a good on-stage chemistry that would work even better if they weren’t having to battle with a truly embarrassing script. 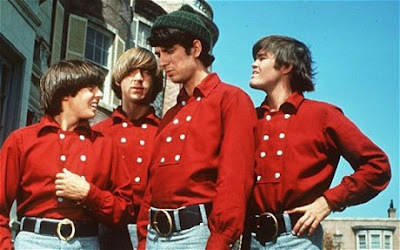 Against the odds they do a fantastic job of recreating the look and sound of the Monkees. The singing is exceptionally strong, especially on the biggest numbers; Hey, Hey We’re The Monkees, I’m a Believer, Last Train to Clarksville, Valerie, Stepping Stone and Daydream Believer and in the second act we are treated to a multi-national set of renditions of The Monkees theme! Ex-X Factor and Wicked alumni Cassie Compton, does a decent enough job on ‘You Don’t Have To Say You Love Me’, Lee Honey-Jones brings a massive smile with a comic and touching rendition of ‘I Wanna Be Free,’ and the excellent Roxanne Palmer delivers a comic performance as a stewardess (among many other characters) providing some much needed highlights. The only jarring note in the cast were the lacklustre and often out of time dancers. Despite the strength of the main cast there’s little else to redeem this show. It’s a shame. 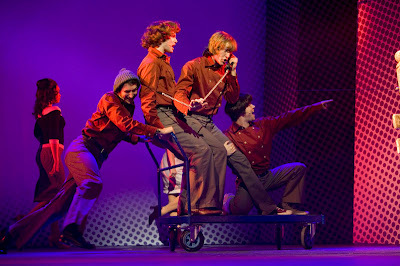 The young cast put their heart and soul into it. 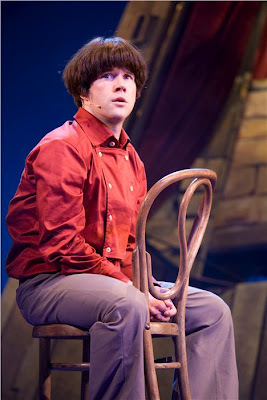 Despite it being another musical based on the back catalogue of a pop band, you want to will anything new to work. There should be promise here but it has just not been handled well. It’s poorly written by someone who seems to be stuck in the worst part of 70’s sit-com land and messily directed with too many over-used old ideas. On a final note – the prospective West End run certainly won’t be happening as the producers have curtailed the tour after this week’s run in Glasgow, cancelling all of next week’s date’s in Sunderland. Last week in Manchester the show was playing to houses of less than 150 and today was the sparsest I have ever seen an audience in this theatre. A shame for the highly talented young performers but shame on the writer for giving them such poor material.